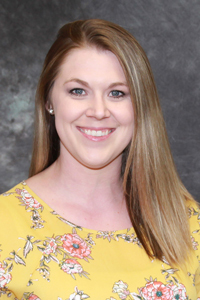 Speech-language pathologist Jessica Jones provides speech, language, cognitive, and swallowing therapy for patients throughout Coffey Health System. Jessica has extensive background working with patients of all ages in rehabilitation, swingbed, acute, and intensive care units. Jessica grew up here in Burlington. She attended Emporia State University for her undergraduate degree, and completed her Master of Arts in Communication Sciences and Disorders at Wichita State University. During this time, she was the lead graduate assistant of the Autism Interdisciplinary Diagnostic Team. Communication can be significantly enhanced through therapy. Speech-Language Pathology is the study of disorders that affect a person’s communication and/or swallowing capabilities. * Children born with birth defects such as cleft palate, cerebral palsy, may begin speech therapy as newborns. * Young children who only babble or play with sounds or who talk but are only understood by the parents should also be considered for speech therapy. * Adult patients usually have health issues that affect the operation of the brain, such as stoke or traumatic brain injury, which impact the individual’s ability to communicate or swallow/eat. The adult population may also include persons with degenerative diseases such as Parkinson’s and ALS. Speech pathologists work in medical, educational, and clinical settings.